Have you ever tried using white beans like small white navy beans in your Asian dishes? It’s simple and easy to do. Here is a quick and easy stir-fry recipe that everyone in your family will love. 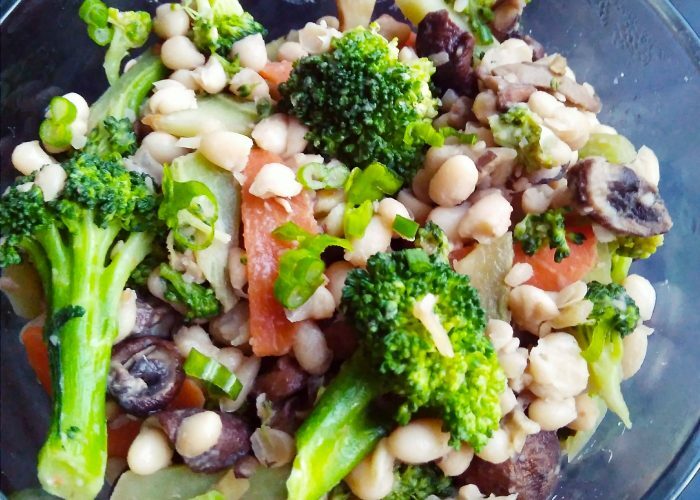 This White Bean Veggie Stir-Fry is vegan, egg-free, dairy-free and nut-free. If you want to make this dish gluten-free, just use tamari sauce instead of the soy sauce in the recipe! For those who are unfamiliar with Chinese cooking wines, this refers to cooking rice wines often found in Asian grocery stores or in large grocery superstores. It may also be called Salted Cooking Wine. Some examples of brands include Shaoxing or Hu Tao cooking wines. The ingredients in these cooking wines are usually water, rice spirit, salt and caramel. Don’t worry about the salt content. In most recipes you would only use about a tablespoon or less of the cooking wine, and a tablespoon provides only 20 calories and 77 milligrams of sodium. However, if you have trouble getting ahold of a Chinese cooking wine in a grocery store near you, you can use Sherry cooking wine instead in this recipe. Enjoy! An Asian vegan, egg-free, dairy-free, nut-free and gluten-free (if tamari sauce is used) dish that is powered with white navy beans to make a nourishing and filling meal. Heat a medium pot half filled with water on the stove. If using canned small white navy beans, drain and rinse these well before putting the measured amount in a small bowl (otherwise just use pre-cooked white navy beans). In this bowl, mix the navy beans with 3 teaspoons of soy sauce, tablespoon of cooking wine, one minced garlic clove and one teaspoon of minced ginger. Stir well and let marinate for about 15-20 minutes. Stir occasionally. While the beans are marinating, cut up the broccoli, carrots and mushrooms. Once the pot of water is boiling, blanch the broccoli and carrots quickly for 1-2 minutes, then remove with a slotted spoon into a separate bowl. Heat up the tablespoon of oil in a large skillet on medium heat. Once the oil is hot, sauté the 2 minced cloves’ worth of garlic and remaining 2 teaspoons of ginger in the oil for 1-2 minutes. Add in the chopped mushrooms. Stir and cook for 2-3 minutes. Add the chopped broccoli and carrots into the saucepan, and drizzle the remaining teaspoon of soy sauce on top. Stir fry these vegetables for 5-6 minutes or until all the vegetables are cooked. Add one teaspoon of cornstarch into the marinated beans and stir well. Then place the marinated beans (along with the sauce) into the stir-fry mixture. Cook for 3-4 more minutes, then turn off the stove setting. Serve! If you have time, you can stir-fry the mushrooms a bit longer in the saucepan until they are caramelized, before adding in the chopped broccoli and carrots. This will bring out the flavor of the mushrooms more in this dish. You can choose to skip the vegetable blanching step. The reason I recommend blanching the broccoli and carrot slices in the boiling water quickly prior to using them in the stir-fry is that this method yields a faster cooking time later when stir-frying these vegetables with the mushrooms. However, if you want to skip this step, just stir-fry the carrot slices and broccoli in the skillet (or wok) for longer until cooked through, before adding in the marinated beans. If you don’t want to slice the carrots, a quick method is just to grate the carrots using a large holed cheese grater!